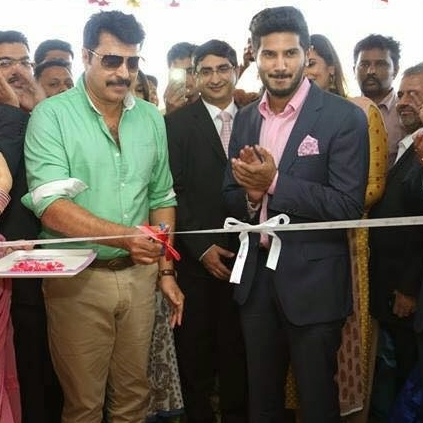 Megastar Mammootty burst into laughter when director Kamal commented that he'd be delighted to see Mammootty acting as the younger brother of Dulquer Salmaan. The director described Mammukka as a very open minded person, and with a hint of pun he admitted that he was jealous of Mammukka's appearance. He also pointed out that while all his hair had greyed, Mammukka's looks stood resolute through the test of time and that he is handsome as always. He recalled that when Mammukka had asked him to dye his hair and stay young, the director wittily responded by suggesting that he would call him 'Mammootty' if he prefers it to 'Mammukka', which would subtly mask his age. Mammootty took all of Kamal's comments about his looks and youthfulness with nothing but enjoyment. While Kamal modestly admits to being jealous of Mammootty's appearance, he also said he worshiped the actor for his hard work and dedication to his profession as well as for the pain he takes for the maintenance of health and beauty. Kamal concluded by reverently advocating that there is no other actor such as Mammokka in these aspects. Varalaxmi SarathKumar To Pair Against Mammootty For A Malayalam Film. People looking for online information on Dulquer Salman, Mammootty will find this news story useful.